“What’s new about the news that Delhi can now have microbreweries?” – This comes as the first reaction from Delhi restaurateurs who are not yet celebrating the latest development in the process of the setting up of microbreweries in Delhi. Delhi’s Excise Policy for 2015-16 had allowed restaurants and hotels to open microbreweries within their premises. But nothing changed after that as breweries were under the prohibited category of Delhi Development Authority’s (DDA) Master Plan for Delhi 2021. In the latest development, Lieutenant Governor Anil Baijal has cleared the technical hurdle to enable the issuing of licences for microbreweries, and it has now been decided that microbreweries will be moved out of the prohibited category. Under the current rules, small breweries are considered as liquor-making plants, which are banned in Delhi. Excise Commissioner Amjad Tak has said that units of up to a 500-litre capacity will be set up, and that the assessment of the possibility of pollution due to residue has been already done. “It turns out that these (residue) will not cause any pollution. Only a few applications are pending with the department and these will be approved soon in keeping with the norms for microbreweries,” Tak was quoted as saying. However, restaurateurs say that this might be just one hurdle that has been removed – they can’t be sure about setting up microbreweries until licences are actually issued. “Going by the history and attitude of various authorities in Delhi, it is very risky to invest in a microbrewery in Delhi. 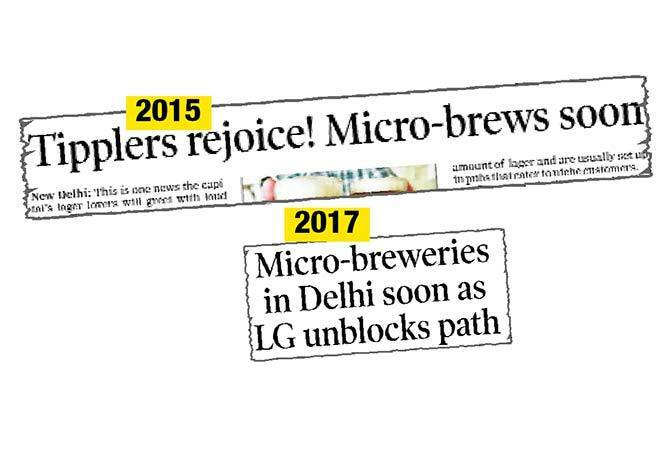 Two years ago, when it was announced that Delhi can now have its own microbreweries, many people invested in plants and microbrewery set-ups, but it only resulted in losses as they couldn’t procure licences. As a restaurateur, I would wait for someone else to get a licence first and set up a microbrewery, and then take a risk. I have two microbreweries running successfully in Gurgaon, but when it comes to Delhi, we are always very careful as there are multiple roadblocks for procuring licences. I don’t know if it is good news yet for Delhi’s nightlife, which has been losing out to its neighbour Gurgaon because of the attitude of various authorities here,” says restaurateur Priyank Sukhija. In 2015, when it was announced that people won’t have to drive to Gurgaon to have freshly brewed beer, it was considered a big boost for Delhi’s nightlife, but roadblocks in its implementation made the restaurateurs change plans. “For a city which is popular among tourists, it is positive news, but how soon can we have microbreweries? We have Gurgaon and Bengaluru as successful examples. The image of Delhi’s nightlife has changed drastically in the last two years and many restaurateurs are now deciding to move to other cities. In such a scenario, this news comes as a ray of hope, but everything’s speculation right now,” says restaurateur Zorawar Kalra. Does Delhi have enough space for microbreweries? Restaurateurs also say that the microbrewery as a concept will work better in a city like Gurgaon over Delhi. “The crowd in Gurgaon is young and is more interested in trying out new things, while in Delhi, we have a mixed crowd. Whisky is more popular with the Delhi crowd. We feel that microbreweries will still work better in Gurgaon over Delhi, so we tend to question if it will be worth all the cost and hassle of getting a licence for it,” says restaurateur Umang Tewari. He adds that setting up a microbrewery requires a lot of space and such areas are few in Delhi. “Buildings in CP, which is a very good location for business, won’t be able to take the pressure of a microbrewery. We need a sturdy structure and preferably a ground floor for that.” he adds.